By Louisa McGrath | April 10, 2012. On 13 December 1815 heavy rain fell on the Curragh, Co Kildare, but this did not stop the crowds of people on their way to watch a bare-knuckle boxing match. The Dublin boxer Dan Donnelly fought the English champion George Cooper in front of 20,000 spectators. Despite the long odds on Donnelly, after 11 rounds and 22 minutes he won the fight with a final punch that broke his opponent’s jaw. The national amphitheatre where the fight took place was renamed Donnelly’s Hollow after the victory. This was Donnelly’s second time to defeat a renowned English fighter. His victories were celebrated nationwide. And at a time when Irish people were frustrated with their English rulers, the boxer became a symbol of Irish nationalism and power. However, after this fight Donnelly decided he wanted a steady job and he became a publican. He managed three pubs in his lifetime, but ran them all into the ground. 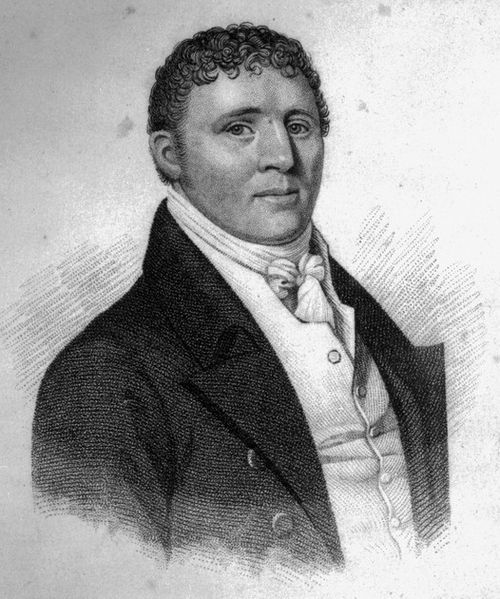 A portrait of George Cooper, the boxer Donnelly defeated to earn national fame. Only one of his pubs still exists today and it is the well-known Fallon’s Capstan Bar on New Row South. He was there in 1818 pulling pints, as well as knocking them back. He lived on the corner of Francis Street at this time too. To this Donnelly replied, “I’m not your royal highness, but I’m the best in England.” It is said that after this encounter the boxer was knighted ‘Sir Dan’. Despite his enormous strength, sickness overcame Donnelly and he died in 1820 at the young age of 32. Tens of thousands of mourners filled the streets of Dublin to attend his funeral. Donnelly was buried in Bully’s Acre in Kilmainham, which was Dublin’s only free graveyard then. At this time grave robbers were hired by doctors and teachers to steal bodies for medical research. Because of the lack of security in Bully’s Acre body snatchers from York Street managed to steal Donnelly’s body. This caused national outcry and after some minor incidents the police prioritised the search for the body. Eventually it was found in possession of a surgeon named Hall; he gave back the body, but the right arm was missing. Donnelly’s body was once again laid to rest, but his arm on the other hand was set to travel more than Donnelly himself did. The limb was preserved with lead paint and sent to Scotland. It was examined by medical students in Edinburgh University for many years. It was then passed on to the owner of a Victorian travelling show, who profited for many years from exhibiting Dan’s arm around Britain. In 1904 the arm returned to Ireland; it was put on display in a glass case in a pub in Belfast, coincidentally called the Duncairn Arms. Here they claimed that the arm was the longest in history. Later it was displayed in a Kildare pub near Donnelly’s Hollow, before going on tour around the world with the The Fighting Irishmen exhibition in 2006. The exhibition was in Ireland for almost two years, 2009-2011. So almost 200 years after the death of the Irish boxing legend, Dan Donnelly’s muscular right arm continues travel the world and surprise people, just as it did when he used it to knock out the English champion fighter George Cooper in 1815.